We are looking forward to partnering with local Metis/Scot artist Amy Thibodeau, connecting textiles, silkscreening and traditional beading techniques in our upcoming Art 4 Homeschoolers classes! Register and/or pay for the AM or PM class below. NOTE: Registrations and payment can also be made in person at Art In House. NOTE: Currently you need to fill out the form for each child separately. You are purchasing a 4-class session of Art 4 Homeschoolers for 5 - 11 year olds. Add additional siblings for a $10 discounted price. Cicada Textile Classes - For Adults! Adults also need to have some art-making fun! We are adapting the workshop with local Metis/Scot artist Amy Thibodeau, connecting textiles, silkscreening, and traditional beading techniques in our upcoming Cicada workshop for adults! Come and enjoy a relaxed morning of creativity with local artists in our community. Are there any special needs, health concerns, or allergies we should be aware of? If so, please describe below. From time to time, we use the photos taken at our workshops for advertising, blogging, or promotion through our website or social media outlets such as instagram or facebook. Please check below if you give permission for Art In House to take and use photos of you for promotional purposes. I give permission for Art In House to use my photos FOR PROMOTIONAL PURPOSES ONLY through artinhouse.org and affiliated social media. I DO NOT give permission for my photograph to be used for promotion by Art In House. Cicada Workshop - For Adults! You are purchasing a 4-class session for the Adult Cicada Workshop. Make sure to join us on April 6th for the opening reception of Light the Way, Letizia Firmani’s Photography Exhibit. My name is Letizia Firmani; I am a 23-year-old Italian artist, who moved to Canada from Italy in 2013. I enjoy experimenting with a lot of mediums, but I would say photography is how I prefer to express myself. After my move to Canada, I majored in photography, and graduated from Seneca College in 2016. My work is strongly influenced by classical art, and MAGNUM photographers such as Josef Koudelka, and Sebastiao Salgado. The contrast between defined classical beauty and an impactful image as they come together to tell their story can be very inspirational. I plan a lot of my work in black and white; my interest for light and dark goes back to my Italian roots, as Caravaggio is one of my favorite painters. I have to thank my mother for this love of visual arts and classical painters and I feel that I was quite fortunate to have had the opportunity to grow up surrounded by art in every shape and form. My work explores the relationship between critical theory and emotional memories; everything I make is being created mostly to express my emotions, and retell my experiences. We are excited to showcase the work of third year Georgian College student Yourong Zhao. As an artist, I capture the life, emotions, vitality and warmth of my subjects. This is true whether it’s about the contemplation of nature, or discovering the meaning of life. My symbolic work conveys a subjective, emotional and harmonious response to the natural world. My artistic “meanderings” weaves together the ideas, dream, and experiences from my past and present, and recombines them in unique ways. I deliver this group of quiet works that emphasize the inner life of my subjects, the human being turning inward and reflecting upon himself and his soul. Each work reflects my desire to capture the spiritual presence sensed out of doors -- in woods, flowers, and the sky and the moon/stars. My works put the soul into the landscape, to experience myself out in the isolation of nature. For the artist figurative art is not a restricted diet of examples but rather a rich bed of blossoming opportunity. For the art lover an entree to a larger discussion where narratives fold into aesthetics as a site of observation, interpretation, and escape. Is it the drive of curiosity that compels the artist to record his fellow human being or is it the need to create a compelling and fictitious Frankenstein? Asking these questions opens but two possibilities - the artist as storyteller, and the artist as documentor. There is however a third possibility that the artist can assert, the bringing together of both the fictitious, the fantastic, and the real. It is often the figure that creates dialogue in the mind of the viewer when looking at a work of art; creating both a simultaneous connection of imagination and curiosity. That same figure can shape our understanding or lack of understanding of the setting and place in time. Their pose, body language, gaze, and clothes, can reveal or obscure the way we take in an image. In the end whatever the path the artist chooses and whatever the media he or she uses the corpse will always be exquisite; truth being stranger than fiction, makes for uncanny portraits and surreal tableaus of human activity. The artists would like to thank Art In House, FastSigns, their families and friends for all the support in making this exhibition happen. Andre Beneteau…...your expert care and commitment to a job well done is greatly appreciated. We have been so privileged to have the work of Katie Green up at Art In House. Her exhibit is still on and runs until Nov. 3rd. 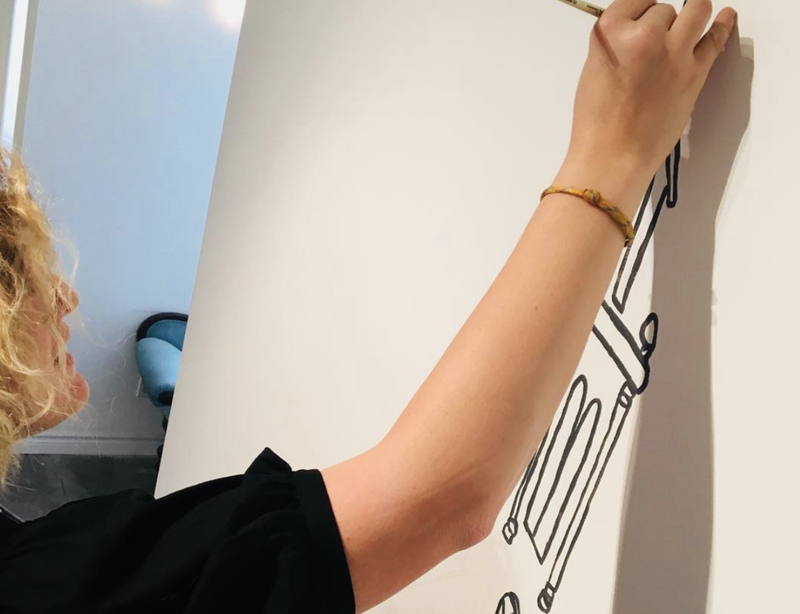 As part of the vision for the exhibit, Katie had envisioned facilitating an interactive, community element at Urban Sketch. At the opening Katie had hand painted Collier Street United Church in Downtown Barrie directly on the wall of our gallery. To close out the show we will be timelapsing the community completing the work by filling it with colour. Come down any time on Nov. 3rd from 10am - 2:30pm to join us for the celebration of our community and Katie’s work. Get on down to the Lakeshore Mews to catch Katie Green’s new exhibit: Urban Sketch. Doors open at 2pm and the opening reception runs until 4pm. Katie Green is a local artist whose watercolours have captured many of the happenings in downtown Barrie. See more of Katie’s work at katiegreen.ca and make sure to come down for the show opening Oct.13th. This show has grown out of my love of urban sketching, both in my hometown and places I travel. A small sketchbook and pen fit in almost any bag and have the added bonus of getting me to sit in the same spot anywhere from 5-20 minutes. Having filled a 1/2 dozen sketchbooks I am now taking these drawings farther, adding watercolour, turning them into block prints, screen prints, a colouring book and more. It is a journey exploring the places I’ve been and my own creativity. JOIN US IN THE MORNING (10:00 - 12:00) OR AFTERNOON (1:00 - 2:30) ON WEDNESDAYS FOR AN 8-CLASS HOMESCHOOL PROGRAM. SEE DETAILS AND REGISTER NOW! Take a break this summer, and make art... with us. Summer is a great opportunity to kick back, and rejuvenate the creative process. Our lives are busy and often we sacrifice our creativity and art-making for the never-ending task list of urgent "must-dos". In this spirit, the AIH Gallery will be closed for the month of July so that we can celebrate and honour time to create. At AIH, Mar and I (Jon) have recognized we have gotten far too busy, we are excited to take the month of July to make space to make art. We have created the #arteveryday-AIH hashtag to share some the things we get up to over the course of the month. This isn't about pressuring ourselves to create, but recognizing we need to make space in our days to do this. We understand social media can be a great way to inspire others, but sometimes it becomes a space where we feel pressure to build portfolios and share to an audience. The #arteveryday-AIH is not meant to create pressure, but instead act as opportunity to share when you are ready. Mar and I will definitely not be posting daily, but we do look forward to sharing bits of inspiration when creativity strikes. Fiona Legg's latest exhibit is based on the concept of sin, representing notions of sin through sculpture. The exhibit culminates with Fiona's interpretation of what is missing from the Biblical record of sin, and it's connection to the current state of the world. I chose to use necklaces as the vehicle to represent the sins, as they could be considered to be an unconscious expression of a concept (sin) pertaining to the wearer. Using necklaces also gave me license to develop objects of beauty incorporating symbolism, which is my preferred method of creation. I thoroughly enjoy using a wide variety of materials and techniques in my objects and this collection is no different – heavily based in fibre, I have used media such as Paverpol, stained leaf skeletons, feathers, and a large amount of needle felted foam cylinders to create the necklaces. How might we create a skateboard graphic that represents our identity? Future Design School specializes in Design Thinking, a framework for creating ideas that help to solve real world challenges. Note: Participants in this free workshop will only prototype their designs and not actually be painting them on skateboard decks. A second, paid workshop will be offered for those who would like to paint their designs on a skateboard. Join us for the opening of Evolve & Echo an exhibit by textile artist Susan Kendal on April 21st from 7 - 9 pm. A reflection on family, legacy, lore, and genetics through textiles. So my starting point for this body of work was Hanna’s description of her choreography, which “explores the strength behind the family bond,” and “questions what makes a family stick together through the thick and thin.” When Hanna and I discussed her choreographic and creative process, she articulated that she also looked beyond family to larger community movements, considering what galvanizes a group to gather to find common ground in spite of differences such as social standing, political leanings, etc. Join us for the opening of We Decided to Take the Long Road Home featuring Georgian College Artist Justin Cosman. Opening Reception: March 24th at 7pm and runs through April 7th. creative process can act as both a therapeutic outlet and subject of an artwork. objects from materials often considered inconvenient in the modern day. An exhibition of art and writing - Andre Beneteau, Carol-Ann Ryan, Emily McKibbon, Greg Ivany and Sean George. vastness, its power, and its people. landscape at 150 federated years old. SCC hopes to question the use of artistic media and how it blurs the line between image and reality. WE HAVE REDESIGNED OUR PROJECTS FOR THE WINTER! EXPLORE MULTI-MEDIA VISUAL ART PROJECTS FOCUSING ON COLOUR! Eleven 9 - Exhibit On Now! Come down and celebrate the thoughtful, bold work of 9 grade 11 students featured in Eleven 9! Eleven 9 showcases students from a grade eleven artist collective, experimenting with media and technique. The exhibit involves a series of emotionally expressive work highlighting the female youth perspective on a variety of societal problems. Each of the 9 artists represent personal perspectives on issues surrounding their experience and those they interact with. Eleven 9 runs until February 3rd. Save the date for Give Local for the Holidays! More details to come. GIve Local is just around the corner! Check out our Vendor page to see who will be joining us this year! We had a number of inquiries about the galaxy project we did with our homeschool group. In response we are offering this galaxy workshop for adults on Nov. 21st! Join Ron for the opening of Fascination: Paper, Aug.18th @ 7pm. Exhibit runs until Dec.9th. We are excited to start off the fall with our homeschool art program featuring all new projects for your kiddos. Mar is teaming up with textile artist, Susan Kendal for two, four-week sessions! The second session of Art 4 Home (schoolers) starts on Nov.1 and runs until the 22nd. Classes are every Wednesday. We have loved watching Fiona's creativity ooze from the back of AIH for the past few months. Make sure to come down and experience her Careless Remnants exhibit on until Nov. 6th. The first session of Art 4 Home (schoolers) starts on Oct.4th and runs until the 25th. Classes are every Wednesday. Our fall gallery season begins this Saturday, Sept. 16th with a collaborative exhibit featuring works from women in our community. Under Our Skin is funded in part by a grant from the Ontario Arts Council. Opening reception begins at 7pm. Join Art in House, Bohemia & J'Adore for an afternoon/evening filled with local artisans, food, music & twinkly lights downtown Barrie on the Lakeshore Mews. Join us on June 24th from 7-9 pm for the opening reception of Wind Swept by Jenna Stewart. Jenna's images reflect the beauty, ruggedness and wonder that is our great Canadian landscape. Learn more about Jenna's work at her website: jennastewart.ca. The show will run through the rest of June and the month of July. If we don’t see you on the 24th, hopefully we will see you sometime during the summer! Registration is closed for this event as it is the second of a 2-class session workshop. Experience abstract painting with us as we explore and layer a variety of mediums, stencils, and colour. A creative project inspired by the vibrancy of spring and Danish artist Mette Lindberg. Anything you need us to know? We are offering a "family" workshop this coming Saturday. Bring the whole family and print your own spring terrariums. We recognize the uniqueness of families. This workshop is an opportunity to make art with those close to us, those we consider family. Please register online. Payments can be made online or on the day of the workshop. An emotional portrayal of humanity. My works are a catalogue of my thoughts and emotions laid bare - things that I could never speak out loud, but are suddenly blurted out onto the canvas. My art is an extension of my body and soul. Using my hands to apply paint, smudge charcoal or configure a sculpture allows a physical connection to work that I find exhilarating. By letting my thoughts flow organically from my mind, through my body and into the work - I take the chaos of my own dismal thoughts and turn them into meaning and beauty.